Costume designers for Indiana Jones, The Blues Brothers, The Hunger Games, and more dish on their process. If a film is doing its job, you’re probably not thinking about how its costumes were made–you’re wrapped up in the story, forgetting that the characters are just actors in carefully manufactured garb. But the stories behind the designs of Hollywood’s most famous garments can be as rich as the films themselves. You couldn’t make John Belushi look good. He was an adorable mess. Hollywood Costume, opening October 2 at the Academy of Motion Picture Arts and Sciences in Los Angeles, puts 150 legendary costumes on display, from Dorothy Gale’s ruby slippers and gingham pinafore to Captain America’s superhero suit, highlighting clothing’s crucial role in cinematic storytelling. The exhibition’s curator, Deborah Nadoolman Landis, spent five years researching and designing the exhibit. She’s also the costume design mastermind behind classic films like Indiana Jones: Raiders of the Lost Ark, Animal House, and The Blues Brothers. Also on view are getups by costume designer Judianna Makovsky, whose wizardly work for Harry Potter and the Sorcerer’s Stone earned her an Academy Award nomination; she also dressed Katniss Everdeen and her fellow fighters in The Hunger Games and the cast of Captain America: Winter Soldier. We caught up with Landis and Makovsky about the behind-the-scenes stories of their beloved designs. “We’re the mothers of the clothes,” Landis says. “We know them and their individual stories intimately.” Here, 10 things you probably never knew about the fedora and leather jacket that turned Harrison Ford into Indiana Jones; the pinafore that traveled over the rainbow; the hunting jacket that made archery stylish; and more. In Indiana Jones: Raiders of the Lost Ark (1981), Indiana copped Charlton Heston’s style in Lost Treasure of the Incas. Landis: [Stephen Spielberg and I] both knew that Indiana Jones’s character was based on an archetype, and we immediately knew what the costume was meant to be. 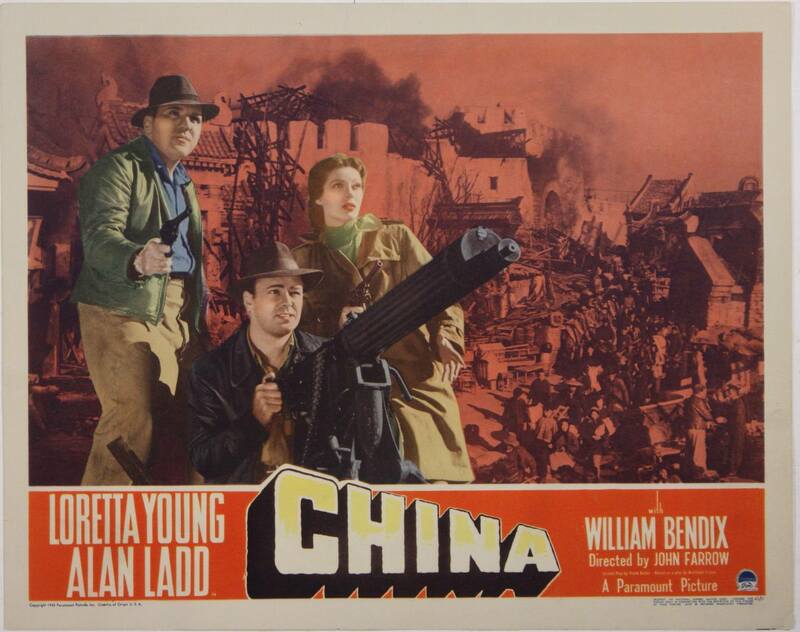 In the early planning stages for Raiders of the Lost Ark, we screened some movies: China, with Alan Ladd, wearing a brown fedora and leather jacket. 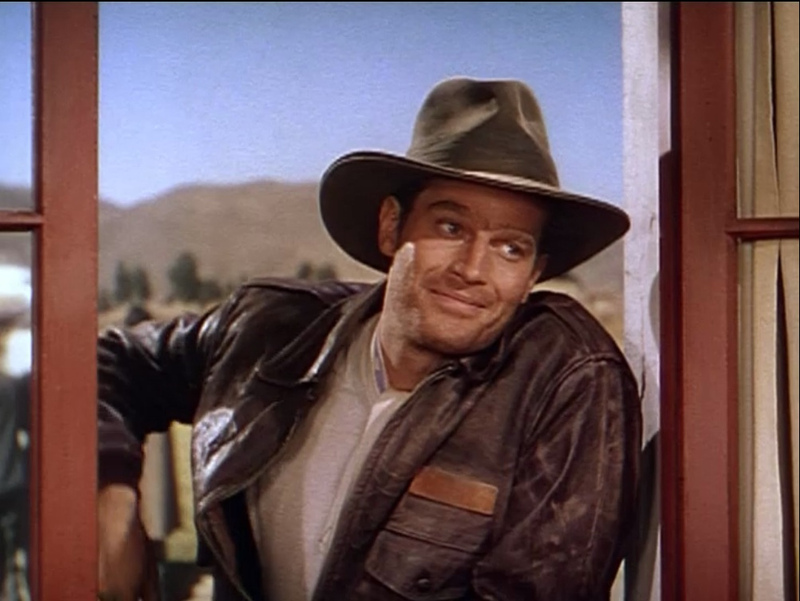 Then, Lost Treasure of the Incas, released in 1952, with Charlton Heston wearing exactly the same costume. And then into The Greatest Show on Earth, with Charlton Heston, again, wearing a leather jacket and a brown fedora. So we knew what the costume had to be. All that was left was for me to create it. It wasn’t that different from my friends designing Batman, Spiderman, and Superman costumes, looking at either comic books or concept art and saying okay, let’s make this real. Indiana Jones’s pants were inspired by the uniforms of the California highway patrol. DL: I wanted to make really, really tough wool pants that would survive all the stunts Indiana Jones had to do. I ended up using a tan wool twill used by the L.A .highway patrol, nicknamed “pinks.” No one would’ve expected that really, for practical purposes, Indiana Jones is wearing the exact same fabric as the California highway patrol. Landis slept with Indy’s rolled-up fedora underneath her mattress to faux-age it. DL: The night before we left to shoot in La Rochelle, France, [in 1980], Indiana Jones’s jacket wasn’t ready. It wasn’t aged. I threw a brand new leather jacket into my suitcase, and the next day, before shooting, I sat by the hotel swimming pool, with Harrison Ford’s Swiss Army knife, while Harrison had a drink. I used some sandpaper, a suede brush, and an awl to punch holes, and I aged the leather jacket myself. We rubbed it with mineral oil and vaseline to make worn spots. My fingers were shredded, my hands were a bloody mess by the next day. The hat, too, I had to age: I brought a new hat I had designed, made by hatters in London, and rolled it up and put it under my mattress and box spring, covered in vaseline, fool’s earth, and mineral oil on the band. I haven’t been given an award yet by the Archaeology Society of America, but a friend at UCLA’s archaeology department thanked me for making his profession cool. Indiana Jones is wearing the exact same fabric as the California highway patrol. The suits in The Blues Brothers (1980) were designed to exaggerate Dan Ackroyd and John Belushi’s comical height and weight differences. DL: Dan [Ackroyd] and John [Belushi] had created these characters for Saturday Night Live. What they used to do was use any old sunglasses and any black hats and any black jackets and pants. It really worked for SNL, and that was great. But when we came to do the movie, where the Blues Brothers have this incredible journey, with a script co-written by my husband John Landis, part of the conversation was, here are these pre-existing characters, so how do we streamline their costumes? John Belushi gave away all his character’s rare, out-of-production Ray-Ban Wayfarers away to fangirls. DL: There was a problem, though, because Ray-Ban had stopped manufacturing Wayfarers. I went all over the place to find them. I bought every single pair of black wayfarers from every sketchy part of the city. I ended up with two dozen pairs and used every single pair, and John Belushi kept giving them away to girls and drove me completely crazy. Then Tom Cruise wore Wayfarers in Top Gun, and Ray-Ban started making them again. Dorothy Gale’s gingham pinafore from The Wizard of Oz (1939) required 16-year-old Judy Garland to tape down her breasts to play a 12-year-old girl. DL: I really had an epiphany when I saw the pinafore from The Wizard of Oz. This 75-year-old little tiny dress is owned by a British collector, and lives most of the year in a safety deposit box in a bank vault in London. When the collector came forward to say she’d like to be part of the Hollywood Costume show, she invited my assistant and I to go to the bank and look at the pinafore. We went to see the pinafore with a gaggle of DNA conservators and put on special conservator gloves. I saw that flat panel on the back of the chest of the pinafore [which was used to flatten Garland’s breasts], and that really got to me. It made me really cry. Despite being made by Adrian, one of the most legendary costume designers of the 20th century, Dorothy’s pinafore is shoddily crafted. DL: I cried, because the pinafore is really badly made. The inside seams are totally uneven. You can see that the sewing machine skips. And it was a revelation about costume design. Consider the history: it was 1939–the greatest year of Hollywood movies. The designer, Adrian, was the uncontested greatest designer in Hollywood. Adrian was the king. He ran the MGM workroom like Dior. Every single suit was French-seamed, made as beautifully as any French couture. They could make anything–for Norma Shearer, Paulette Goddard, Joan Crawford, Greta Garbo. So why was Dorothy’s pinafore so poorly made? The pinafore Judy Garland wore in The Wizard of Oz is really badly made. And that’s what this dress is like. This pinafore is really like a piece of the true cross for the costume designers, and I hope that’s not heresy. It feels like your favorite pillowcase. It’s so soft. And it’s made so badly, and with so much love. It expresses everything about farm culture in the Dust Bowl. It’s not a costume, it’s really Dorothy Gale’s dress. In The Hunger Games (2012), Katniss Everdeen’s hunting jacket, described in the book as bulky and oversized, was slimmed down for both sharp-shooting and sexiness purposes. Costume designer Judianna Makovsky: When we started designing Katniss’s hunting costume, we tried to follow the description in the book exactly. The book describes her jacket as her father’s old hunting jacket. We drew inspiration from American mining work clothes, and also looked at leather jackets from the ’30s through the ’50s. But the first jacket we made, from leather, really didn’t look good. Because it was meant to be her father’s, it was oversized, and way too big and bulky. It impeded her from shooting the arrow. So finally, after testing it out, I said, “I think we should make a jacket that actually fits her.” I knew superfans might be disappointed, but in a filmic, realistic sense, the oversized jacket just didn’t work. Captain America liked the costume so much he didn’t even take it off at lunch. 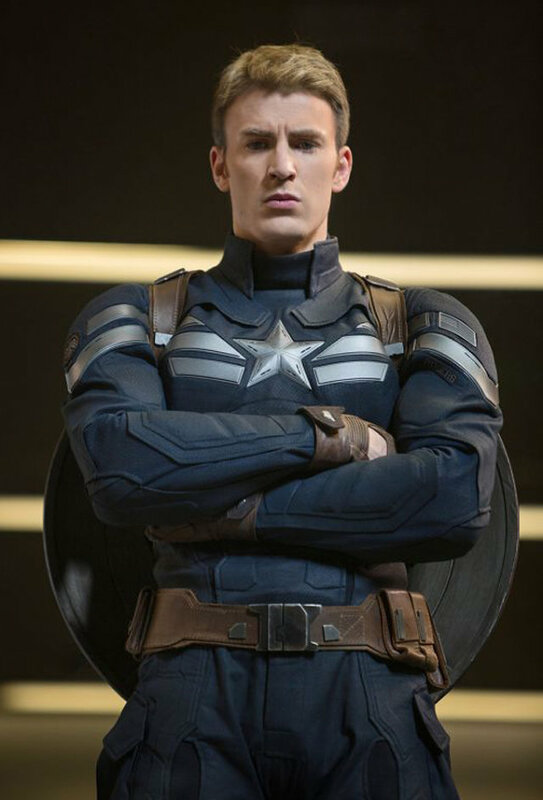 The suit in Marvel’s Captain America: Winter Soldier (2014) might look like it’s made from Kevlar, but it’s actually screenprinted stretch fabric. JM: We call this costume the stealth suit. It’s not Captain America’s iconic red white and blue suit. Because the tone of the movie was a political thriller, not a classic superhero action film, directors wanted to calm down the comic aspects. They wanted a more functional, practical suit, something more like military tactical gear, made of kevlar. But it had to be stretchy, it had to move, because of all the stunts. Kevlar doesn’t do that. So it took four months to create a fabric that would look woven, like kevlar, but it was actually stretch fabric, with a little bit of a ridge in it, made of four fabrics that stretch in different ways, screenprinted with specialty inks to give the illusion of toughness and thickness. And Chris Evans [as Captain America] could actually move around in it. He was like, “I can move! I can jump! I can play and run around!” We were asked to build something he could get in and out of easily, but he liked it so much he didn’t even take it off at lunch. Hollywood Costume opens October 2 at the Academy of Motion Picture Arts and Sciences. Click the slide show above for images of more classic costumes on view.